Celery may very well be the Cinderella of the produce aisle. It's a vegetable that does a lot of work. It's a common ingredient in base recipes upon which other flavors are built. 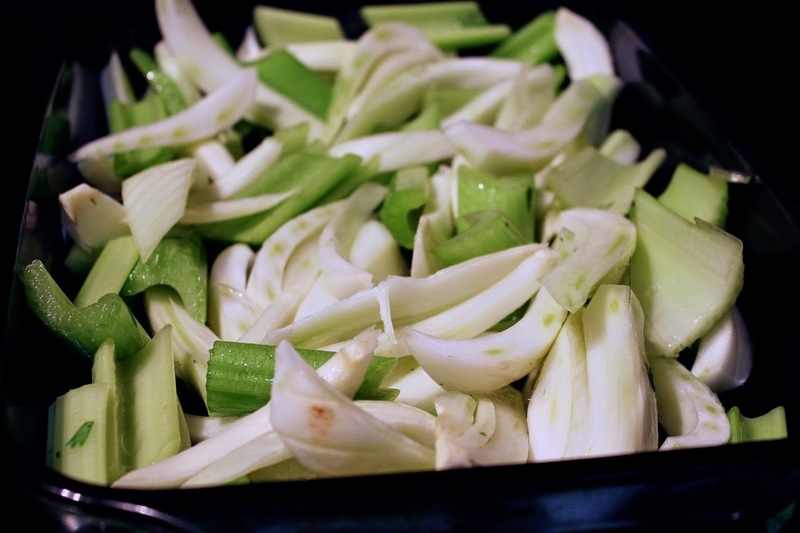 Lots of stews, stuffings and casseroles begin with sautéing diced celery, generally with onion, and also sometimes carrot, a classical cooking trinity known as mirepoix in France or Soffrito in Italy. Celery is often around but never the star, while wicked step-sister vegetables like kale, Brussels sprouts and radishes bask in all the glory. But celery has a fairy godmother, and that's peanuts. Peanuts bring out the best in celery, which is why the classic snack of celery and peanut butter is such a refreshing treat. A couple years ago, I created a simple celery and peanut salad highlighting this pairing, a recipe that caught the eye of both my mother (she's reportedly served it to friends for lunch) and The New York Times. I revisited the combination of celery and peanuts for this dish, which uses these ingredients in a warm roasted vegetable side with Southeast Asian flavors. It's a nice complement to a meat dish in a similar vein (I served them alongside these Thai Chicken Thighs with Garlic and Lime). 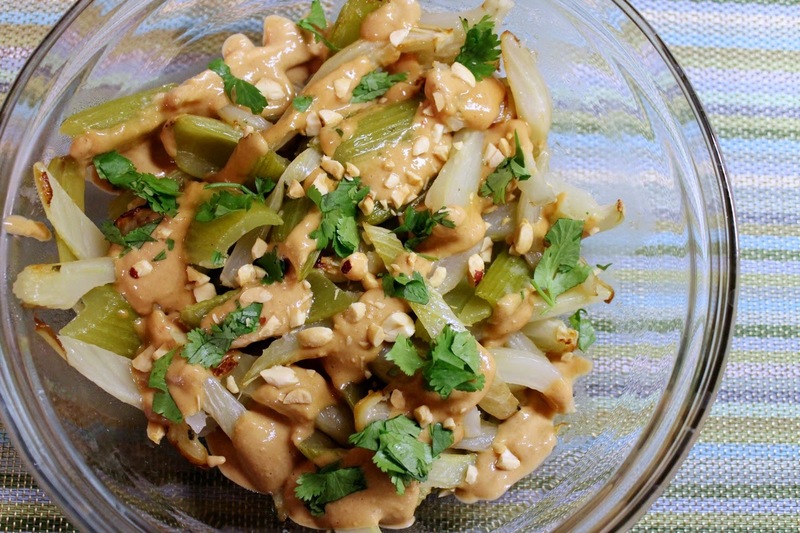 Here, celery and fennel are roasted together until tender and lightly browned and then dressed with a spicy-tangy peanut sauce before being finished with a sprinkle of cilantro and roasted peanuts. It's a simple, but satisfying dish that's a healthful excuse for eating peanut sauce (more healthful, I tell myself, than just peanut sauce with noodles). Although its flavor is mellowed by the roasting, celery is still the star, melding beautifully with the peanut sauce, fennel and cilantro. When it comes to organizing the cast of your next Asian-inspired dinner, you may gravitate toward bok choy, daikon radishes or eggplant, but I think it's high-time to throw humble celery a glass slipper. 2. 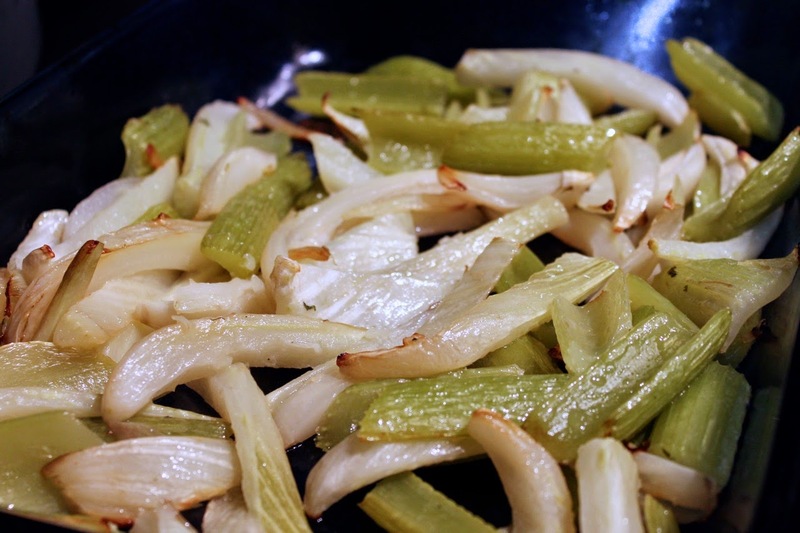 Combine celery and fennel in a large bowl. Add the oil and salt and toss to combine. Spread in an even layer in a 9 X 13 roasting pan and roast until tender, about 20-30 minutes, stirring every 10 minutes. 3. In the bowl of a food processor, combine the ginger and garlic and pulse a few times to mince. Add red chili pepper flakes, peanut butter, lime juice, soy sauce and fish sauce and pulse until combined and smooth. Add enough water to achieve desired texture (it should be thin enough that you can pour it over the roasted vegetables, but not so thin that you couldn’t see it—aim for traditional yogurt thickness). 4. 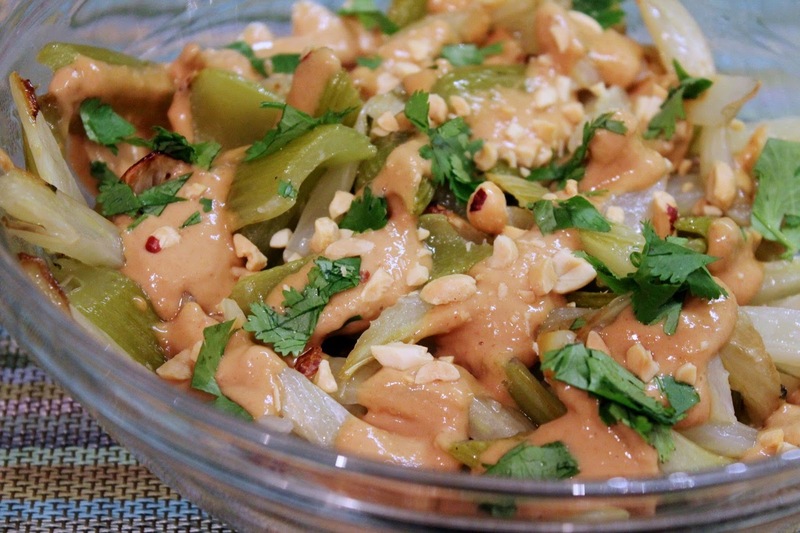 Serve the vegetables topped with peanut sauce, chopped peanuts and cilantro. Nicely written, and a good dish. Thank you! I'm trying to be more creative this year and explore more Asian cooking in particular.